We’d love your help. Let us know what’s wrong with this preview of A House for Hermit Crab by Eric Carle. Poor Hermit Crab! He's outgrown his snug little shell, so he finds himself a larger one -- and many new friends to decorate and protect his new house. But what will happen when he outgrows this shell and has to say good-bye to all the sea creatures who have made Hermit Crab's house a home? Children facing change in their own lives will relate to Hermit Crab's story -- and Poor Hermit Crab! He's outgrown his snug little shell, so he finds himself a larger one -- and many new friends to decorate and protect his new house. But what will happen when he outgrows this shell and has to say good-bye to all the sea creatures who have made Hermit Crab's house a home? To ask other readers questions about A House for Hermit Crab, please sign up. At the beginning of the year, Hermit Crab finds his current shell is too small. He ventures out in search of a new one, only to discover that it is drab. Carle takes the reader along throughout the months, as Hermit Crab decorates and finds protection for his new house. By the end of the year, the shell has become too small again, forcing him to make a significant decision. Neo has long been an Eric Carle fan and liked the colours and less than mainstream illustrating. This repetitive story about a hermit crab moving into a new shell has a great rhythm and also provides opportunities to practice counting and identification of new creatures. Everyone here really liked this and I think we'll soon add it to our home library. A very fun book about a hermit crab who is trying to decorate his shell. A creative book that promotes creativity. What a brilliant way to explain symbiotic relationships in the ocean. Dig it! "A House for Hermit Crab" is a cute little story that definitely relates to me! I am always looking for things and such to decorate my house with. Every time I see something, I want it just like the Hermit Crab. I am constantly on the look out for new items to grab as well as bargain items to refresh old ones. Sometimes I begin to wonder if I am a hoarder with all the decor, but I really enjoy being crafty and decorating plain items and making them new. An excellent allegory for change. Eric Carle is a legend. 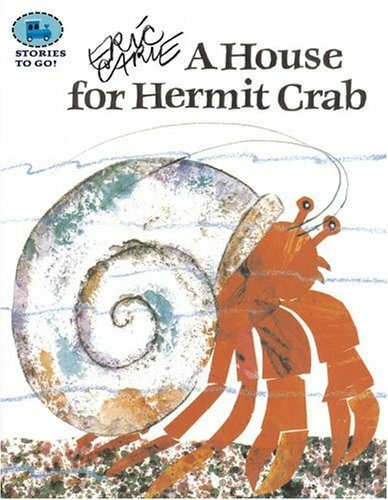 A House for Hermit Crab is another example of Eric Carle's incredible ability to craft a simple yet meaningful story and let the beautiful illustrations be the star of the book. The book begins with a hermit crab who is growing up and has become too big for his current home-his shell. Luckily, he easily finds a new shell to live in, but he has decided that this new shell is much too simple for his liking and sets out to decorate his new home. On his journey, he meets many other sea creatures, su A House for Hermit Crab is another example of Eric Carle's incredible ability to craft a simple yet meaningful story and let the beautiful illustrations be the star of the book. The book begins with a hermit crab who is growing up and has become too big for his current home-his shell. Luckily, he easily finds a new shell to live in, but he has decided that this new shell is much too simple for his liking and sets out to decorate his new home. On his journey, he meets many other sea creatures, such as sea anemones, sea stars, and coral, and asks them to help him decorate his new house. The hermit crab is smart though, and learns that if he is kind to the sea creatures he meets he will make a friend for life that will be happy to help him. At the end of the story, a year has gone by and the hermit crab has again outgrown his current home. Although reluctant to leave, he ends up giving his current shell to a smaller crab for whom this old shell is a perfect size. The crab then goes out to find his next home and is excited by the idea of decorating a new place! A HOUSE FOR HERMIT CRAB is a charming story about the habits of a hermit crab, with a subtheme : the breaking away from the old and venturing out into the new. When Hermit Crab outgrows his old shell, he has to find a bigger place in which to dwell. His new home is old and very plain. But, bit by bit, anemone and starfish and crusty coral come along to adorn it; snail keep it clean, sea urchin (prickly and fierce) love to protect it and lanternfish light it up. Hermit is a happy crab. Until his c A HOUSE FOR HERMIT CRAB is a charming story about the habits of a hermit crab, with a subtheme : the breaking away from the old and venturing out into the new. When Hermit Crab outgrows his old shell, he has to find a bigger place in which to dwell. His new home is old and very plain. But, bit by bit, anemone and starfish and crusty coral come along to adorn it; snail keep it clean, sea urchin (prickly and fierce) love to protect it and lanternfish light it up. Hermit is a happy crab. Until his cozy quarters become too cramped and again, coming full circle, he has to let go of the shell (along with the comfort of the sweet and familiar). "I couldn't stay in that little shell forever," said Hermit Crab as he waved goodbye. The ocean floor looked wider than he had remembered, but Hermit Crab wasn't afraid....."Sponges!" he thought. "Barnacles! Clown fish! Sand dollars! Electric Eels! Oh, there are so many possibilities!...." So many possibilities : the important message about accepting the cycle of change with an open mind, a message made simple and gentle as only Eric Carle can. I learned a lot about hermit crabs too (stuff I didn't know - I'd actually never heard of a hermit crab until reading the book) and the illustrations are attractive and easy to follow. A House for Hermit Crab is a delightful story about under the sea friendship. Hermit Crab feels that his shell is too plain and enlists the help of sea creatures such as anemones and urchins to help him spruce it up, protect, and light it. At the end of the story, Hermit Crab graciously passes his shell on to another crab in need. This story has beautiful illustrations, a positive message about working together and being kind to those in need, as well as exciting new ocean animal names with accu A House for Hermit Crab is a delightful story about under the sea friendship. Hermit Crab feels that his shell is too plain and enlists the help of sea creatures such as anemones and urchins to help him spruce it up, protect, and light it. At the end of the story, Hermit Crab graciously passes his shell on to another crab in need. Re-read - This book has grown on me over the years. I read it again this week to my littlest and she loved it. Perfect book as we continue our arthopods study unit. Such a good story of making friends, being kind, sharing, and not being afraid of change. My daughter now wants a hermit crab of her own. Overall, this is another beautiful read from Eric Carle. Also I changed my star rating to 5 stars instead of 4. My students are reading all about habitats, so this is a great book for that topic. It is very cute! In this book, a hermit crab grows out of his shell. He must find a new one, but when he does, he thinks it is very plain. So he proceeds to go across the ocean floor and find "friends" to help decorate his house. They help him clean and see and protect his home. A major theme of this story is friendship, as the hermit crab cultivates new creatures on his journey and they form a strong bond. I would give this book a four-star rating. The illustrations are beautiful and very characteristic of Eric C In this book, a hermit crab grows out of his shell. He must find a new one, but when he does, he thinks it is very plain. So he proceeds to go across the ocean floor and find "friends" to help decorate his house. They help him clean and see and protect his home. I would give this book a four-star rating. The illustrations are beautiful and very characteristic of Eric Carle. The story flows well and really shows the meaning of friendship, sharing, and relying on others. However, it leaves out details and it does not have a clear lesson to be learned. I personally like this book because it is simple without being mundane. It provides a storyline that is easy to follow with illustrations that are wonderful to look at. It is enjoyable to read and has great underlying messages for kids, especially of a preschool age. I was worried after reading my first two Eric Carle selections this year that my decision to read as many of his books as possible was a mistake. However, this book changed my mind and buoyed my spirits. A House for Hermit Crab is an enchanting story of cooperation, kindness, codependency and growth. It can be used in a variety of ways in a classroom, including as an introduction to various parts of speech and as a step into scientific habitats. I was recommended this book because of the illustrations. I love this author and liked how the hermit made friends with all the animals. I also liked the theme that you stay with other people no matter what. I would use this book for 3rd grade but could use the book for read aloud at any grade level. I like this book because he tried to find a shell; he found a shell in January and it looked very plain and he found lots of people on the way and he decorated on his house. He walked along and the shell got too big and he found some rocks and he asked "Do you mind if I arrange you?" and they said "not at all!" A House For Hermit Crab is a cute adventure about a hermit crab outgrowing his shell and setting out to find a new one and making it his own. The story can be related to a child growing up and moving on to their next classroom grade, a transition that can be a little sad, but with exciting new possibilities. This book could be used in science, writing or art. There are several facts about hermit crabs that could grab the students attention. There are also many different sea creatures introduced. Students can talk about new words they leaned and work on predicting what will happen. Students could also learn to draw their own hermit crab and decorate its shell. This book covers all twelve months and introduces young ones to a variety of sea life. Back matter in the back of the book provides non-fiction information about the sea animals encountered in the book. It has quite a bit of text, but fans of Eric Carle’s illustrations will enjoy looking at the pictures. I have very mixed feelings about this book. The hermit crab does choose a few friends on more than looks. It does teach a lesson on moving on. Still, it just seems mean to me. These creatures left their families! Classic Eric Carle: bright colors and a story that grows as it's told - and then could continue beyond the end. Growth isn't a bad thing, look at all the new friends Hermit Crab met on the way to his new space and as he sought to make his home beautiful. It's not so different for people. A hermit crab goes and looks for ways to decorate his new shell. I don't like many Eric Carle books, but I did like this one. It's a little bit wordier than some, but I think that the story and sentiment are great. A House for Hermit Crab is about the twelve months, about symbiosis, about creativity, and about adapting to growth and change. Each one of Eric Carle's books express a different aspect of learning for students and I feel as though they are related to a student's interests whatever that might be. Love the art style of Eric Carle's books. My three-year-old son was fascinated with the many sea creatures who volunteered to help the hermit crab decorate his home. It would be a great book to use to help a young child cope with moving. This book is interesting and I know more sea creatures than I knew earlier. It is colourful and has an interesting storyline. I loved the colourful illustrations. The board book is of a comfortable size and easy to flip and navigate through.